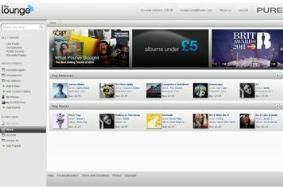 UPDATE: Pure adds music store to revamped Lounge media portal | What Hi-Fi? Pure has today officially relaunched its Lounge media portal, giving the site a facelift, improved functionality and a brand new online music store. Version 2.0 of the Lounge delivers access to almost 200,000 different pieces of audio content, including thousands of internet radio stations, podcasts and on-demand content from the likes of the BBC. Pure claims the all important search functionality has also been improved to make finding your way through all that content much easier. Crucially, you can now be able to buy tracks on the Lounge, too. Pure's FlowSongs service already allows some radios to tag and buy tracks, and the chance to buy tracks is now extended to any user via the Pure Lounge. Playlists can be managed on the radio and in the portal, while tracks can also be downloaded to a multimedia player. Social media has also been integrated in to the Lounge, allowing you to share favourite stations or on-demand content via Twitter or Facebook, alongside editorial content. iPhone owners can listen to The Lounge via a special iPhone app. The new Pure Lounge is live in the UK from today.